White Chocolate Bunny Ears: The Bird and The Bee. Diamond Dave (2009). The Bird and The Bee. Diamond Dave (2009). Here's a band I never give a thought to, which is unfair because every time they show up in a shuffle play on my iPod I remember how much I like them. They epitomize much of what I esteem in music I most cherish: beauty and style, humor, and skillfully meticulous arrangements. 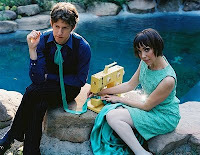 Greg Kurstin has worked with some of my most favorite artists, such as Kylie, and Sophie Ellis-Bextor. Inara George's voice is rare; utterly relaxed but precise as a laser.